I pulled out some new Verve to use today. I used the Smile Plain Jane for my sentiment. I also used the Banner Bundle Set, the star border from the Scalloped Trim Trio Die Set and the largest star from Starry Die. The star was cut out of Kraft cardstock, ran through my crimper, then distressed with cream ink. Accessories: A Cut Above Dies: Banner Bundle Set, Scalloped Trim Trio Die Set, Starry Die (Verve); Crimper, Button, Hemp cord, Foam tape, Thread, Sewing machine. Stephanie your card is just beautiful. Love that paper and great stitching. This is gorgeous Stephanie! I love the papers you used and these new PJ's are my FAVE!!! Love these colors and the crimped star accent...GORGEOUS!! I love your card, Sephanie! Great colors and very neat stitching. Beautiful! Great card, Stephanie!! Love the stamping on patterned paper!! This card makes ME smile! 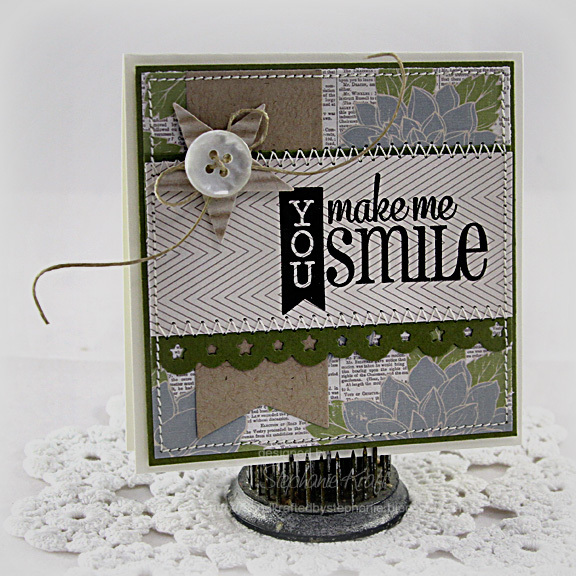 Great combination of elements and great stamping! :-) Happy Easter to you and your family Stephanie! Love this, Steph! That star with the button and twine is the sweetest little embellishment!